Does anyone outside Westminster care about the Leveson Inquiry? Posted in Media, Politics on June 17th, 2012 by Leo – Comments Off on Does anyone outside Westminster care about the Leveson Inquiry? The Leveson Inquiry is increasingly being talked about as a Westminster soap opera, of no interest to the bulk of the country who have better things to do with their time than read (or write) political blogs. And so Labour’s continued efforts to keep the news focus on Jeremy Hunt have frustrated those who think the party is missing much more valuable opportunities to attack the government on the economy. The former Labour general secretary, Peter Watt, argued that for the vast majority it’s “a hugely embarrassing waste of time and money”. 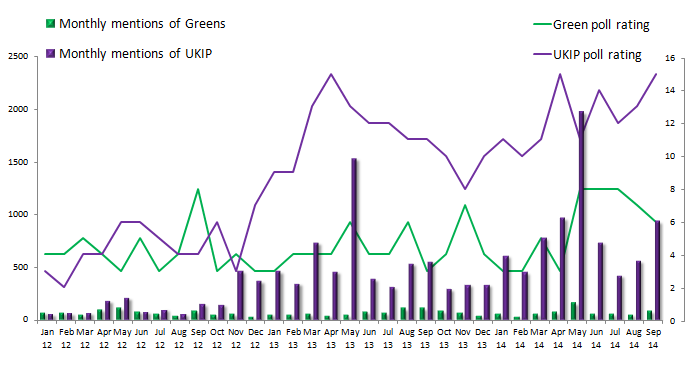 But public opinion data suggest a more mixed response to Leveson. Starting with the evidence for the Peter Watt view, it’s clear that neither phone hacking nor more recent revelations from Leveson have ever been the most pressing issue for many people. In August ’11, after the Milly Dowler story broke, MORI found that only 1% put phone hacking in their list of most important issues facing the country, and revelations about the relationship between the government and News Corp haven’t registered in the index at all. At the end of last year, only 4% said that phone hacking and the Leveson inquiry was the most important news event of 2011. 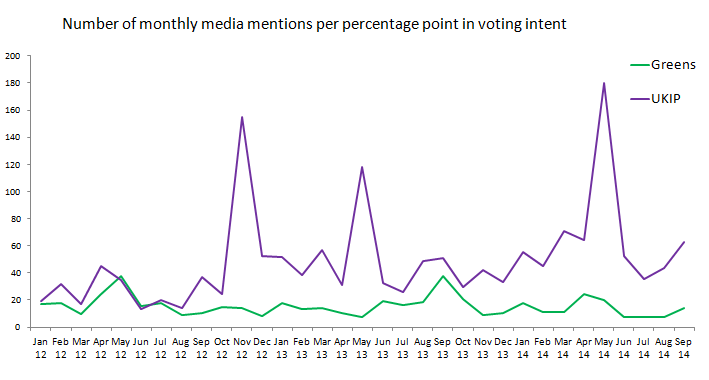 So the numbers suggest that despite repeated news coverage of the story, the public refuse to see it as a top issue. From this it could be argued that if politicians want to stop being out of touch they need to start talking about something that the country is really worried about. And yet, I increasingly think it’s more complicated than that. Though not many people think phone hacking and Leveson is one of the biggest issues facing the country, it’s doesn’t seem to be an irrelevance either. Exhibit A is Google’s search volume index. A comparison of searches for “economy” and “recession” with “phone hacking” and “Leveson” since June ’11 shows that it isn’t the case that the economy has always been of more interest than phone hacking and Leveson. 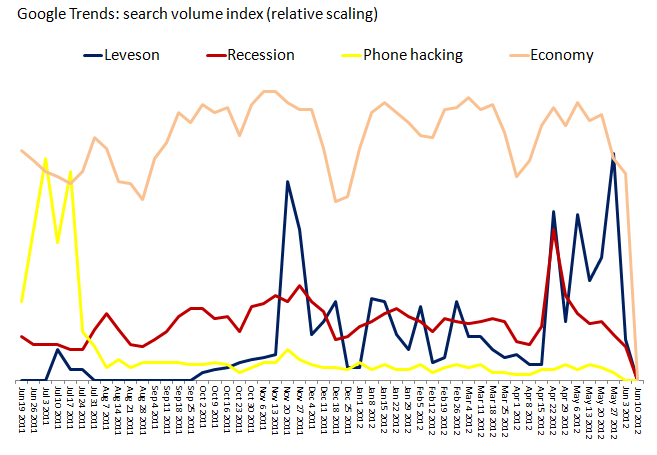 “Leveson” and “phone hacking” have often been searched more than “recession”, and in three one-week periods were searched more than “economy”. 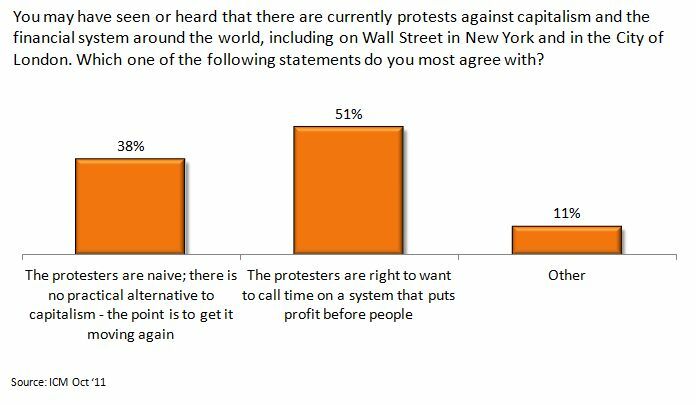 But just because people are interested doesn’t in itself mean that it’s bad for the government. We saw a couple of months ago that more people think that Hunt should resign than said the same for previous ministers who’ve been in trouble, but perhaps this was the product of a general anti-government and anti-politics mood rather than to do with anger about the Leveson findings.